I’ve just got a trio of “old” trip reports left before the backlog is officially filled. I hope to knock out the remainder the by end of the year so I can start off 2019 with a clean slate. 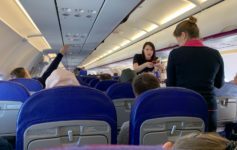 This trip report will review a number of flights from a couple years ago, the highlights being first class on the Thai Airways and Asiana A380. If you’re new to this blog, a bit of background is in order. My blog was somewhat dormant between 2014 and late 2016. During that period I took many trips, wrote many trip reports, but never published them. Since I moved Live and Let’s Fly to Boarding Area in late 2016, I have been slowly publishing these reports. Some ask why and I think the answer is simple. First, these are previously unpublished so it is not like I am recycling any information. Second, very little actually changes onboard. When changes have occurred, I am aware of them and note them. Thus, these reports are not only interesting to read, but relevant. Manila To Osaka Via Palau And Guam, All On A United Airlines 737! I booked these flights using United miles. Here’s a hint on the trip report: the flights were lovely. But one in particular stood out.